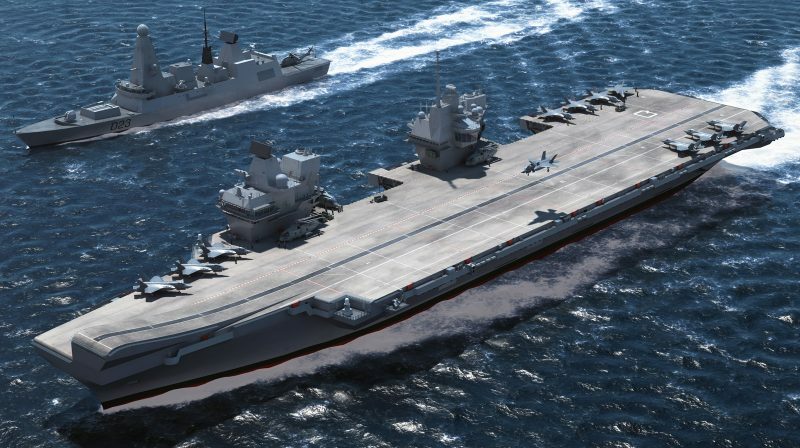 A CGI depiction of the first of the Royal Navy’s new super-carriers, HMS Queen Elizabeth at sea with a Daring Class destroyer. Image: BAE Systems. While there was much talk about the votes of students and other young people being essential to the election of Labour MPs in Plymouth and Portsmouth there had to be another factor, too. In both those English south coast cities Conservative MPs lost their seats to vigorous Labour opponents committed to a strong naval base and dockyard in each city, displaying a more energetic awareness of naval matters. Luke Pollard, the new MP for Plymouth Sutton and Devonport – born in the city with a submariner father who worked in the dockyard after retiring from the Service – said in the warm glow of his election that he would fight to ensure the Labour Party leader gives up his anti-Trident stance. While it is Labour Party policy to retain and regenerate the sea-based deterrent force, it is hard to imagine that Mr Corbyn would not expend every effort if he ever becomes PM to get rid of Trident. With tens of thousands of jobs in Plymouth, the South West of England and elsewhere in the UK depending on SSBN refit work at Devonport Mr Pollard is compelled to fight for Trident. However, Mr Pollard faces a tricky dilemma: To get elected he pursued the vote of young people who were born well after the Cold War and mostly abhor nuclear weapons. Should Labour ever become the party of Government it will probably disband the deterrent force, destroying economy of Plymouth and making many people redundant in a part of the world where skilled, highly paid jobs are already thin on the ground. Many of those who voted for Mr Pollard will applaud such a move while others will not. One way of course for the Devonport MP to ensure the city does not suffer quite so much pain if Trident is axed is to fight for more frigates to be built for the Navy. It needs more than the eight Type 26s and five Type 31s promised by the May government. Devonport Naval Base has always traditionally been the main home for new frigates, so surely stands to benefit most (especially with Portsmouth getting the new destroyers and carriers and Clyde the new submarines). Even so, building more frigates – with probably some based in Hampshire – would also help Portsmouth survive the loss of the new super-carriers Queen Elizabeth and Prince of Wales, which will surely be on the hit list of Mr Corbyn should he ever become PM. The two new 65,000 tonnes strike carriers are designed to project the kind of raw destructive power Mr Corbyn wants Britain to never use. He famously desires bombing of all kinds by everybody on the planet to stop, which in an ideal world is a laudable aim (as is getting rid of all nuclear weapons). Sadly the world doesn’t work that way and sometimes strike carriers are very useful in defending a nation from overseas foes by bombing them. There is every chance the new MP for Portsmouth South, Stephen Morgan, could find himself fighting to keep Portsmouth Naval Base strong while Prime Minister Corbyn seeks to scrap the very ships that make it so. These are complex and interesting times in the UK and the Royal Navy remains fundamental to safeguarding the seas along with British interests and citizens around the world. What kind of Navy Britain might have by the end of this year remains very much to be seen. Should a weak Mrs May be evicted as Tory leader and another General Election result in Labour victory, the much prized vessels the new Labour MPs in Portsmouth and Plymouth must fight to preserve could well be on the chopping block.